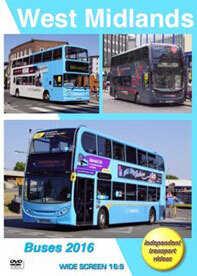 We welcome you to our second visit to review the buses of the West Midlands. This time we cover the eastern side of the region as well as seeing what has changed in the Birmingham area. The buses in the West Midlands are managed by Centro, which has the brand name of Network West Midlands. Their logo, a stylised ‘n’ can be seen on bus stations, bus stops and travel literature in that area. The main bus operator, for the purpose of this video presentation, is National Express West Midlands (NXWM), but buses from Arriva Midlands, Central Buses, Diamond Bus, Igo, Claribels, Johnsons, Stagecoach and First are also seen operating. Our filming begins in Coventry city centre. The NXWM buses in the Coventry fleet are painted in a similar style to the rest of the NXWM fleet, but with sky blue in place of the red that is seen elsewhere. Inline with the current livery upgrade, the Coventry buses are starting to appear in a revised scheme featuring sky blue and a darker blue with a gold trim, laid out in a similar manner to the two tone red main fleet and the two tone grey with a red trim on the ADL E40D Enviro400MMC ‘Platinum’ branded double deckers. At the time of filming in August 2016 the NXWM Coventry double decker fleet consisted of Volvo B7TLs with Wright Gemini bodies and ALX400 bodies, Enviro400s, ADL E40D Enviro400s and Dennis Tridents with Alexander ALX400 bodies. Single deckers are represented by Volvo B7RLE Wright Eclipse 2s, ADL E20D Enviro200s and articulated Mercedes-Benz Citaro O530Gs. Our cameras take up positions in a large number of locations in and around the city centre. Some of these include Corporation Street, Bishop Street, Hales Street, Trinity Street, The Burges, Coventry railway station and Pool Meadow Bus Station. There is plenty of action for you enjoy as we see this very smartly turned out fleet going about its work. ‘Platinum’ liveried ADL E40D Enviro400MMC double deckers are also seen on the 900 service to Birmingham. The NXWM buses are joined on the streets of Coventry by Stagecoach buses, mostly Enviro200s and Enviro400s with a few ALX400 double deckers completing the picture. We take a ride on a NXWM Mercedes-Benz Citaro articulated bus to the busy bus exchange at the University Hospital at Walsgrave. Our next venue is the Georgian town of Leamington Spa. Here we see Stagecoach buses in service, which feature apart from the normal fare some Optare Solos on ‘Gold’ branded routes, Enviro400 double deckers in the red ‘Unibus’ livery as well as a good number of NXWM Coventry buses on their busy frequent services to the town from Coventry. Our filming locations are along Victoria Terrace, the Parade and Clarendon Avenue. Birmingham is our next venue with filming taking place on Park Street, Colmore Row, Livery Street, and Bull Street. We now see the Midland Metro trams in service alongside the buses. You can see the trams in more detail on our ‘Midland Metro’ DVD programme. Further locations in the Birmingham area are at Kings Heath, Ward End, South Yardley and the busy interchange at Birmingham Airport. We conclude our 2016 visit to the West Midlands with footage filmed at Erdington, Sutton Coldfield, Solihull and Sheldon. There is action all the way, and we hope that you have enjoyed our visit to the West Midlands. There will be more to follow!